Dynamic Spine Control - High-Tech Diamond Weave carbon material construction that manages Dynamic Spine in a revolutionary way by isolating oscillation to the middle of the shaft and delivering precision accuracy. RED ZONE - The center section of the Maxima BLU RZ Select is what manages the arrow's flex during flight; technically referred to as Dynamic Spine. The RED ZONE is specifically designed and tested to be the ideal length, position and stiffness to contain Dynamic spine by reducting overall oscillation on the front end allowing for greater overall consistency and tighter groups during competition. Real Straightness - Every Maxima BLU RZ Select is laser checked for straightness to a remarkable 1/10,000 of an inch. 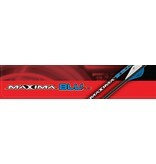 The Maxima BLU RZ Select is checked to a straightness of +/- 0.001" as a maximum measurement, not an average. Launchpad Precision Nocks - LaunchPad Precision Nocks come standard on all Maxima BLU RZ Select shafts to deliver a controlled arrow release, better shaft alignment and more consistent accuracy shot after shot. Nock Collar - Carbon Express proprietary BullDog Nock Collar comes standard on all Maxima BLU RZ Select shafts to protect the shaft against nock-end impacts. The Maxima BLU RZ Select sets a revolutionary new standard for target arrow performance and is the top choice for field and demanding bowhunters. It combines world class, lightweight speed, accuracy and precision specifications of the Maxima Blue Streak Select with the breakthrough RED ZONE technology of the Maxima RED. The result: a new, lightweight target arrow that performs its best when the difference between winning or losing is measured in millimeters! The Maxima BLU RZ Select is made with Carbon Express proprietary Diamond Weave carbon material in an advanced patented design with stiffer front and back ends in order to isolate the arrow's flex in the middle of the shaft: the RED ZONE. A proven design in both laboratory and tournament testing that delivers exceptional performance by combining a "real" straightness tolerance of +/- 0.001" as a maximum measurement, not an average.